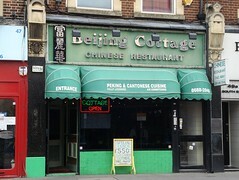 It was previously a Chinese restaurant called Beijing Cottage. As of June 2018 there's a notice in the window photo stating that Beijing Cottage is closed until further notice, and according to the Croydon Advertiser this notice has been there since around the start of March. Last edited 2019-02-07 15:19:19 (version 20; diff). List all versions. Page last edited 2019-02-07 15:19:19 (version 20).